Don’t you love booking travel online? I love traveling and I’m almost always on the go. But booking trips tends to stress me out. Booking sites pride themselves in offering millions of accommodations worldwide. You think that’s good? Think again. Having too many options available is exactly what got me in a very bad, unsafe hotel on my last trip to Paris. I canceled my account with the well-known booking site E*****a. They got me into this mess. After my Parisian disaster, I vouched to only use smaller booking sites. I wanted curated content: a smaller amount of properties. The ones that have hand-selected accommodations they already know are good. 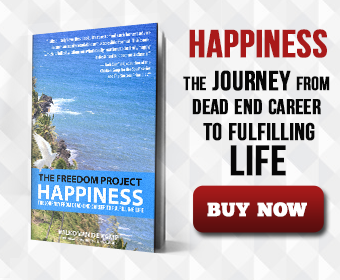 My accompany workbook to The Freedom Project has many of those booking sites listed. I also launched my own travel booking site this year, taking advantage of exclusive deals. Of course you’ll find my favourite Parisian hotels listed. Get your copy of my book and take advantage of the travel research I’ve already done for you. But despite my bad experience, I still love Paris. Paris, in a way, inspired my arts career. It’s a magical combination of ingredients. The smell of freshly-baked croissants. The sound of a musician playing in the subway tunnels. Violins and accordions are still my favourites. And of course the sight of the Eiffel Tower, preferably from the rooftop from another building. If you don’t know what joie de vivre is, you need to visit Paris. The city breathes it. The atmosphere and essence of Paris always leaves you feeling good about life. It got me on my first trip, and gets me again every time I return. Paris is one of the world’s very best cities. You’ll find a rich history, incredible art (you should spend at least an entire day in the Louvre). The architecture is stunning – whether you prefer the Notre Dame Cathedral or the Sacre Coeur and it’s surroundings. Stroll around the Le Marais or Latin Quarter and you’ll discover the heart and soul of Paris. Everywhere you go in Paris you’ll find countless French bistros and wine bars that are perfect for enjoying some of that famous French food and drink. Joie de vivre at it’s finest. The Paris Pass gives you free entry to over 60+ top attractions with Fast Track Entry privileges, a hop-on-hop-off bus tour, a Travelcard to get around the city and a guidebook to plan your trip. I saved both time and money using this pass while exploring Paris – if you manage to visit enough attractions within the number of days you book the pass for it’s definitely worth it. If you don’t want to explore on your own and still do some sightseeing in France, have a look at these Tourism France activities. There’s a wide range of tours to visit the major sites and monuments: guided or non-guided visits, walking tours, hop-on hop-off bus, luxury coach or minibus tours or dinner cruises, among others.